The PC market is moving towards unification. Most of the products are based on widespread interfaces so that a user can combine video cards from company Z, monitors of company Y and mainboards of company F. So, if you buy a hard drive of the IDE interface it's quite possible that it will work on your mainboard (if the latter has an IDE controller). Nevertheless, ASUS has developed a new connector named ASUS Wi-Fi slot. They say that it's just a modified PCI interface with improved power supply. 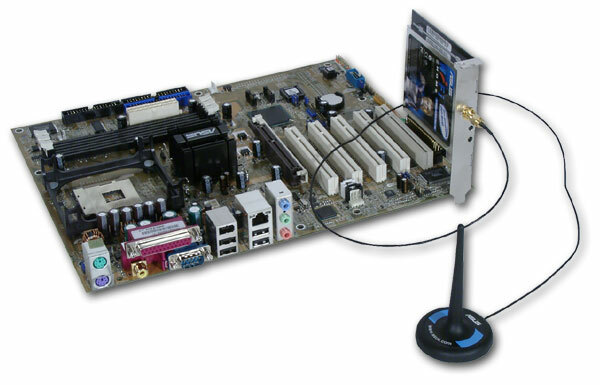 I don't think that the wireless adapter requires more power than the PCI bus supplies. What I can see is that the company tries to tie users to its products, because a card with such an exotic connector wouldn't fit in boards of other companies. On the other hand, such adapter (it comes with the mainboard) lifts the board's cost just by $15-20 (at the moment of the review publication), and the recommended retail price of such adapter is $25. In other words, we get the wireless card for a trifling sum. 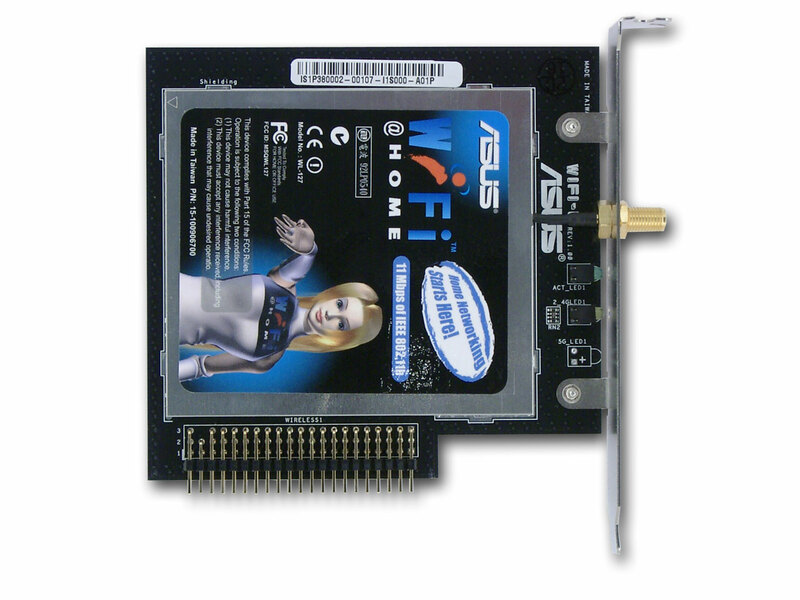 Let's have a look at this ASUS WL-127 card. and an external antenna connector. 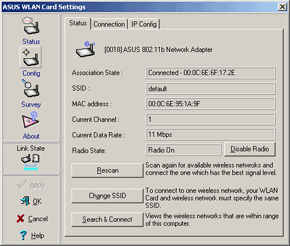 Instead of the PCI slot the card is equipped with the WiFi-b connector which can be plugged only to the special ASUS Wi-Fi slot on ASUS mainboards. The card comes with an external removable antenna (there's no magnet inside the round base), an installation card and a CD with drivers and more detailed documentation. 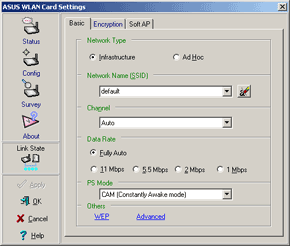 You can configure the card using both Windows means and the card's software. The drivers and configuring is similar to the PCMCIA card described in this review. In the Status and Connection tabs you can check current connection parameters, scan the radio range for networks available, and look at the diagrams of the channel's characteristics displayed in the real-time mode. In the Config tab you can set the network type and rate and web encryption. Here you can also turn your PC into a soft access point. Although it's supported only in the Windows XP, this feature is very useful as you can save on an access point. The disadvantage of such approach is that the PC serving as an access point must be always turned on. 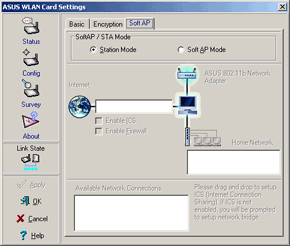 The adapter was tested both in the Ad Hoc and Infrastructure modes (with the ASUS WL-500b access point), in the point-to-point configuration. On one end we assembled the ASUS P4P800S-E Deluxe based PC with the given adapter, on the other end we had a notebook PC with the WL-100 PCMCIA adapter. The data rate is pretty high in both modes, though it's not maximum. However, in the Ad Hoc mode the data rate from the notebook to the test platform falls down considerably. Finally we measured the data rate between the adapter and the PC in the wired segment (with the access point placed in the center). The other parameters are similar to the above ones. The adapter shows pretty good results, though in the fullduplex mode the traffic going into the wired segment takes three fourths of the channel. The WL-127 is a good solution for connecting the PC to 802.11b wireless networks, especially considering its low price, but it can be used only with ASUS boards with the WiFi-b connector. No drivers for operating systems other than the Windows.